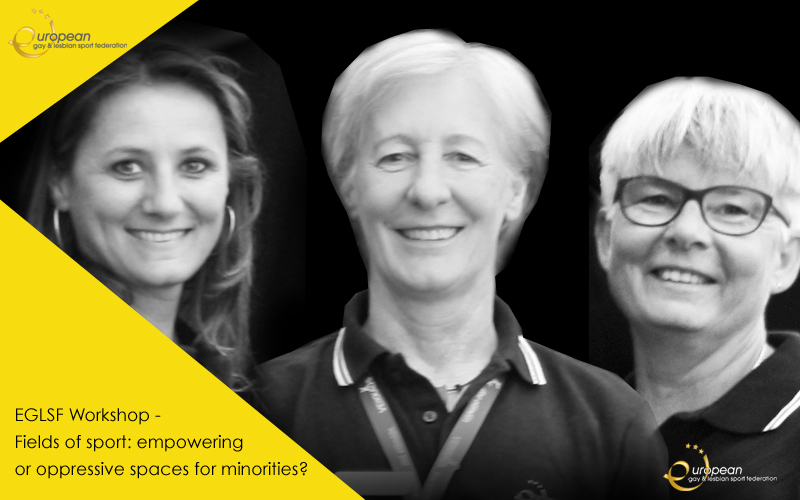 Home/2017, Advocacy, Members, News, Projects, Sport/EGLSF Workshop – Fields of sport: empowering or oppressive spaces for minorities? The EGLSF presented the work we do for our 22 000+ members, the work we do with the Erasmus + EU programmes such as VOICE and Queering Football, how we work with other advocacy organisations such as FARE, and then opened the floor to an open discussion. Our workshop discussions raised important issues and brought home the diversity of our community. As well as being sportswomen we are also older lesbians, lesbians struggling to live in countries where our mere existence is threatened with the death penalty, lesbians in transition, feminists, lesbians of color and more. Sport is our way of expressing ourselves but our sport, our sports partners, our sports organisations and our sports leaders need to accept the diversity of our community and recognize that it is our strength. We are not there yet. But we are willing to take on the challenge, to try and move things forward and create a fully inclusive and safe environment for us all in which to enjoy our sports. A host of other workshops were on offer and we managed to attend several. What came out of all of them is that in sport, in media, in politics, in our health and education systems, and in our workplaces, lesbians and the “L” word are, once again, becoming invisible. By being invisible it is impossible to achieve our goals and improve our life situations. Our existing structures are struggling to keep up with, and for the most part, are no longer entirely valid as solutions for the complexities of our modern day living situations. There is “no one-size-fits-all” solution in sport or in other organisations, and we need to recognize, accept and work with this. As sportswomen, sport is an integral part of our lives, and vital to our physical and mental well-being and we need to make sure that our sports organisations, at the grassroots, national and international level, reflect and our diversity and accept our differences. You can find the complete program on offer at the 1st European Lesbian*Conference at: europeanlesbianconference.org. An official report and handbook of the conference will be edited at a later date.